The second method involves the dialling of shortcode in the phone. 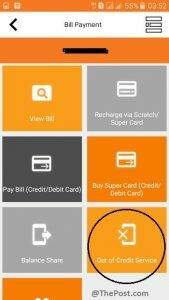 If you are not well-versed with the Ufone app or you do not want to use the app, just simply use this method and get UAdvance. Go to the “Phone” and dial *456# to get the ULoan. 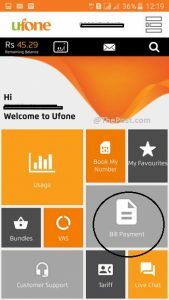 If you do not want to remember the code for call packages, SMS packages and even the code for ULoan service, just download the Ufone app from Google Play Store. If you are using Ufone app, you do not need to remember any code. Just tap the option and you will get it. 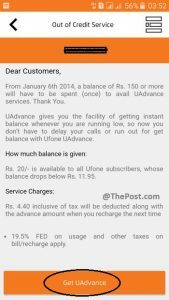 Here is how to use the Ufone app to get ULoan service. Launch the Ufone app. Here, on the Home page, you will see the feature “Bill Payment” as shown in the screenshot below. Tap on it to move ahead. On the next page, you will see some terms and conditions and an option at the bottom “Get UAdvance.” Select the option and that’s it. If your account balance is maximum 11.95, you can get UAdvance. If you are using a new Ufone SIM card and want to get advance, it is mandatory for you to use at least 150 Rs balance before getting the loan. Otherwise, you will not be eligible to get the loan. The loan is 20 Rs that is provided in your account. However, when you pay the loan, you will pay 20 Rs + 4.40 Rs tax on the next recharge.